Understanding the quality, content and structure of your data is an important first step when making critical business decisions. 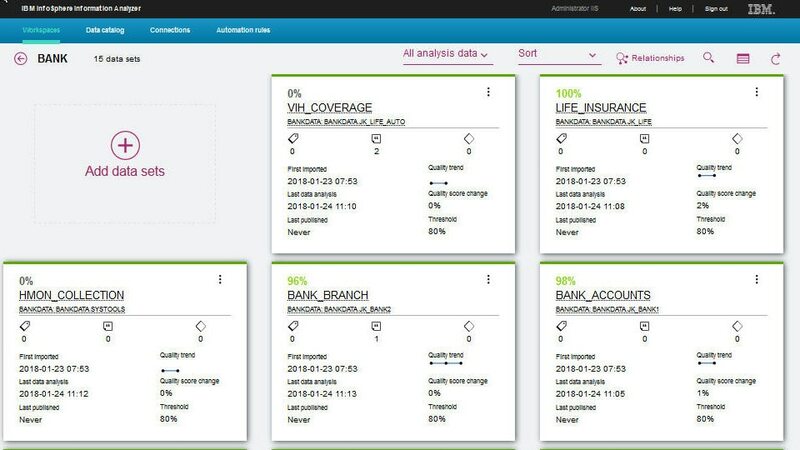 IBM InfoSphere Information Analyzer, a component of Information Server evaluates data quality and structure within and across heterogeneous systems. It utilizes a reusable rules library and supports multi-level evaluations by rule record and pattern. It also facilitates the management of exceptions to established rules. Analyzer helps identify data inconsistencies, redundancies and anomalies and makes inferences about the best choices for structure. Analyzing data is the primary purpose of Information Analyzer. The data profiling, analysis, and monitoring capabilities maximize development resources by identifying missing, incorrect, bad and redundant data before starting a data integration project. Continuous data quality monitoring and feedback reduces the risk of proliferating incorrect information. Facilitating the delivery of trusted content reinforces business users' confidence in the data. Identify and correct problems with data structure or validity before it affects your project. Downstream system costs due to data problems increase exponentially the later they're identified. Create reports that summarize analysis results and show details about your project. Choose from 80 configurable reports for visualizing analysis and trends.